With Spring update we got a new option “Target CRM Version” while exporting the solution. Available options are 6.1 (default) and 6.0. If you choose 6.0, any new capabilities of version 6.1 will not be included in the exported solution and any organizations still using version 6.0 will be able to install the solution. All the removed or modified components will be listed out in a dialog. 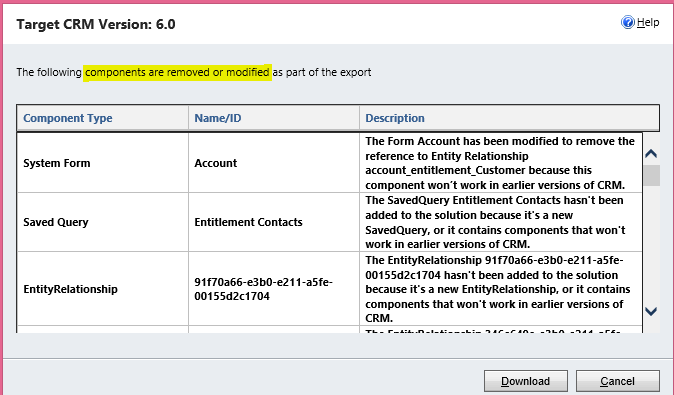 Note – “Target CRM Version” option is unavailable if you export Default solution. In CRM 2013, solution component has an IntroducedVersion property. This value captures the current product version number of the solution that the solution component was associated with when it was created.